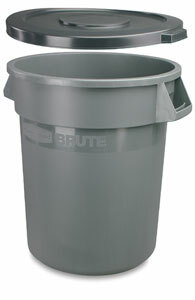 Rubbermaid's Brute Clay Container is ideal for storing wet or dry clay. It features outstanding strength and durability and is extremely resistant to cracking, acids, chemicals, and scratches. It will not leak, rust, or corrode. The ribbed bottom increases stability and improves dragging capability. Its seamless construction makes for easy cleaning. Built-in hand grips. Gray. Ships complete with lid. Measures 19½" diameter × 23" high (50 cm × 58 cm). 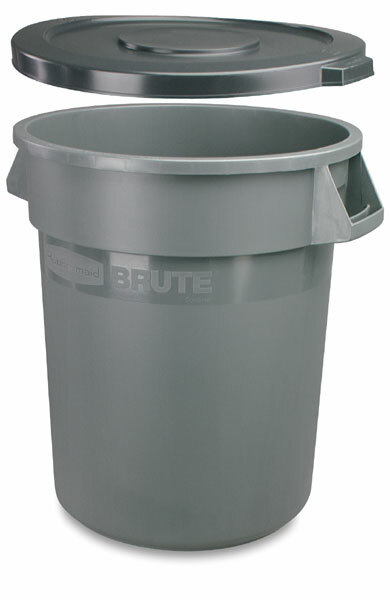 Capacity is 20 gallons (approximately 75 liters). Duramold Dolly — Twist-on, twist-off dolly provides mobility for clay container. Five casters for greater stability.